Frigiliana is a Spanish town in the district of Axarquía located in the Natural Park of Sierras de Tejeda, Almijara and Alhama, so their environment is privileged for lovers nature and that of trekking. 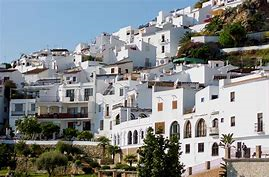 Its white houses, traditional cuisine and its Moorish past of narrow streets and passages make Frigiliana one of the favourite enclaves of those seeking to enjoy their holiday with all five senses. This town owns the purest popular architectural province of Arab origin and received the 1st National Award for Beautification of the Towns of Spain in 1982. It is noteworthy that the British community residing in Frigiliana, as well as throughout the Axarquía, is very large. The Palacio de los Condes (Palace of Condes) of Frigiliana, popularly known as ‘El Ingenio’, is a Renaissance mansion of the XVI century. It is currently the factory of molasses Nuestra Señora del Carmen (Our Lady of Carmen), the only traditional factory of this product that runs in Europe. In its facade, the decoration paintings with geometric motifs are highlighted. It was built partly with materials from the Moorish castle, which can be seen in the stones of its facade. Getting close to the Tourist Office of Frigiliana, you will see Casa del Apero, which also houses the town library and the Archaeological Museum. It was built in the eighteenth century and initially was attached to “”El Ingenio””. Within the Archaeological Museum we can find a skull of the Neolithic, Phoenician vessels or Moorish dagger. The church of San Antonio is the most prominent monument of Frigiliana. It was built in the XVII century in Renaissance style almost entirely. 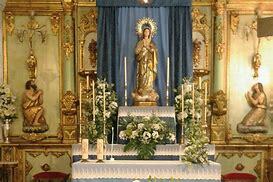 In the temple, there is a sculpture of San Anton of XVIII century made of polychrome wood. In the entrance porch, there is the choir, with a crown of rococo style, and on its main façade, you can see a shield of Bishop Fray Alonso de Santo Tomas. Another monument worth visiting is the chapel of Santo Cristo de la Caña. The building dates from the XVIII century and has a revered size of neo-baroque style ‘Ecce Homo’. We can also find in Frigiliana, the remains of the Arab castle of Lizar. It is located on the top of the town and dates from the IX century . Alameda is a key stop on the ‘El Tempranillo’ Route. A crossroads since ancient times, this town in the Antequera region takes you back to the bandit era when you visit, creating an experience that combines culture, tradition and romanticism. 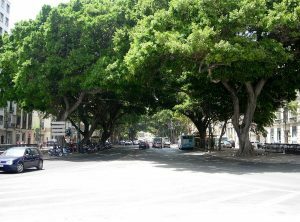 In addition, Alameda possesses interesting archaeological sites and a lagoon that has been declared a nature reserve. All of which provide temptation for lovers of outdoor activities. To recover, what better than the trying the succulent cuisine of the inland town in the Málaga province? Alameda houses the mausoleum of the famous bandit José María “El Tempranillo”. You can see it in the courtyard on the church of the Inmaculada Concepción. This one of the most remarkable buildings in the town. Construction work started in the 18th century and it possesses three dressing rooms. Amongst all of its works of art, a statue of Christ on the cross and a valuable collection of oil paintings stand out. Roman Thermal Baths dating back to the 1st and 3rd century A.D are one of the other cultural treasures of Alameda. They have been declared a National Monument and a Site of Cultural Interest. A Topic Center allows us to know the function of these old baths. However, the presence of man in these lands dates back thousands of years, as testified by Alameda’s Chalcolithic Necropolis, a complex of artificial caves created between the years 2500 to 2000 B.C. In its pits, lithic, ceramic and skeletal remains have been discovered. When you are In the centre of town you can also see the Fuente de la Placeta built in the 18th century. It has becomes one of the town”s symbols. Malaga Airport Transfers can transfer you from Malaga Airport to these Beautiful towns and villages or even from where you are staying on the coast.